Oh it’s time again for another Technostamper Monday Lunchtime Sketch Challenge and Mary Jo really out did herself on this one! It’s a nice and easy sketch that, of course, I took a few ‘liberties’ with! LOL!!! 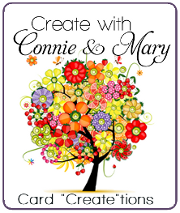 This week for Create with Connie and Mary Card “Create”tions 2014 I am using Zoo Babies for my card set (you have to be a subscriber to see it though). Since this set was sitting on top of my desk I thought I’d use it for Mary Jo’s sketch too! Kaleidoscope dsp (diagonal stripe) – 3 3/8 x 4 5/8. Layer on Basic Black 3 1/2 x 4 3/4 and add to card front. Cut out Film Strip from On Film Framelit in Basic Black. Layer onto Whisper White 2 1/4 x 2 1/2 using dimensionals and add to card front. 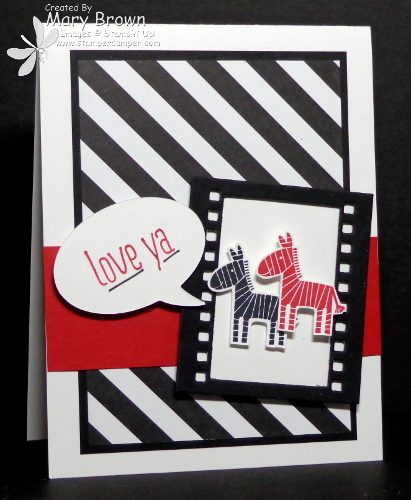 Stamp Zebra in StazOn Jet Black and Real Red, cut out and add inside filmstrip. Cut out the one Bubble framelit (you will be using this backwards) and stamp just to the words from the matching Just Sayin’ set using Real Red. I then took the Basic Black marker and underlined the words. Add the bubble using dimensionals to finish it off. You can see I flipped mine around a bit and changed a couple things but the basic sketch is still there! Don’t forget to check out the other members of the team and remember go to the Technostamper blog to play along! 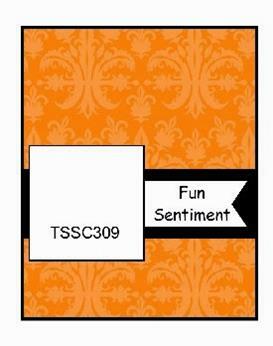 This entry was posted in Technostamper Challenge and tagged Just Sayin', Zoo Babies. Bookmark the permalink. So fun, love the zebras talking! You are so creative. Thanks so much for always making me smile with you cards for my sketch challenge!